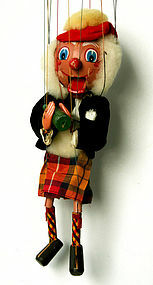 A hand made marionette of a Scotsman (Mac Boozle), from Pelham Puppets, all original with original box and instructions, in very good condition, showing minor paint loss at the rear of the head, made in England, 12" H., circa 1960. 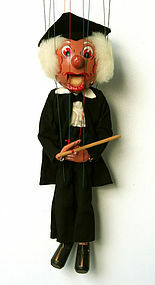 A hand made marionette of a Schoolmaster, from Pelham Puppets, all original with original box and instructions in excellent condition, made in England, 12" H. circa 1960. 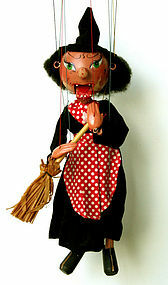 A hand made marionette of a Witch, from Pelham Puppets, all original with original box, showing minor paint loss, made in England, 12" H., circa 1960.